Dan Keating was born on the 2nd January in Castlemaine, Co Kerry. He received his education in local schools, including the Christian Brothers School in Tralee, where he did his apprenticeship. During this time he became a skillful Gaelic football player in his native Kerry. Dan Keating opposed the sellout 1921 Anglo-Irish Treaty and remained principled and faithful to Republicanism, going on to fight on the anti-treaty side in the Irish Civil War. He was involved in operations in Kerry, Limerick, and Tipperary, before his column was arrested by Free State Forces. Keating spent seven months in Portlaoise Prison and the Curragh concentration camp before being released in March 1923. He remained committed to the Republican cause and a dedicated IRA volunteer for a long time after the Civil War. He was arrested several times during the 1930s on various charges. He was active in London during the 1939/1940 IRA bombing campaign. In 1933, he was involved in an attempt to assassinate the leader of the Irish Blueshirts, Eoin O’Duffy, during a visit to County Kerry. The attack was to happen at Ballyseedy, where Free State forces had carried out the Ballyseedy Massacre during the Irish Civil War. However, the plot failed when the person travelling with O’Duffy refused to divulge what car the latter would be travelling in. Dan returned to Dublin and worked as a barman in several public houses. He later returned to his native Kerry in 1978, living out the rest of his life with relatives in Knockbrack. Until his death he refused to accept a state pension because he considered the 26-county Republic of Ireland an illegitimate state which usurped the 1916 Irish Republic. Tralee co. Kerry became a stronghold for the IRA. When there was some British soldiers shot one November night they decided to have this curfew. You had some very bitter policemen in Tralee also.’ Keating had begun working in Gerry McSeeley’s bar and bakery in Castle Street in Tralee, as an apprentice barman. ‘The first year you got no money, but you were well fed, before rising to a pound a week in the third year.’ His involvement in republicanism came not from lengthy historical or political study but from being swept away in the fervour of the time. He said there was no relevant history taught in schools, and that he and others were simply reacting to events and following each other into the ranks of the IRA. ‘It was the thing to do at the time—there was a wave and you got caught up in that.’ He was too young to join the IRA and joined the youth wing, Fianna Éireann, instead, providing information, from the vantage point of the bar or from elsewhere. The registration plate of the car was to be phoned to an office in Tralee by Stephen Coughlan, later to become mayor of Limerick, who was working in the city. ‘We had very strict instructions about the number of the car not to make any mistake. The man that was to give us the word, Stephen Coughlan, his conscience got the best of him and he decided to give the wrong number. And Duffy escaped into town.’ Even though he did not follow him to Tralee, Keating was nevertheless jailed for six months for involvement in a riot that erupted subsequently in the town between Republicans and Blueshirts after O’Duffy’s arrival. Keating went to England afterwards to work in the bar trade again, returning to Ireland before heading for England once more in 1939 to take part in the disastrous IRA S-Plan bombing campaign. He worked in a bar in The Strand in central London, owned by the Irish publican Mooney, but, unknown to his colleagues, he led an IRA cell in the city. ‘I had a number of men there—three or four active men. We kept ourselves small. And we laid bombs whenever we got the chance. You would have to say we were very successful for a long time. You would select places and one of the places we selected was the Grosvenor Hotel in Park Lane. The bomb was laid at the back of a flowerpot. The only thing was to try and cause as much confusion as we could. But as time went by, what we were doing was nothing. The war was on.’ Keating said that his targets ranged from electricity facilities to bombs left in shops near closing time, timed to go off during the night. He said that he had no concerns about attacks on civilian targets, but that no one was killed in his operations and none of his unit was captured. His IRA active service career ended when he narrowly evaded capture by Scotland Yard detectives and returned to Ireland. He was interned shortly after his return, before release in 1944. A legacy from a rich aunt in America helped him and his wife, Mary Fleming from Waterford, to set up home in Dublin, where he worked in the bar trade until her death in 1977. Keating said that he offered a safe house to Republicans and, despite having senior policemen as friends and neighbours, stored guns too. He returned to his native Kerry a year later, but continued working as a barman well into his eighties when friends opened a pub in Kilmallock, Co. Limerick. Keating remained active in the background, siding with the Provisionals in 1970, and followed Ruairí Ó Brádaigh into Republican Sinn Fein (RSF) in 1986 after the split over ending abstention in the Dáil. He was a patron of RSF when he died. In robust health and walking several miles a day unaided until he suffered a stroke in August 2007, Dan Keating passed away on 2 October 2007 in hospital in Tralee. His funeral oration was given by Ruairí Ó Brádaigh. 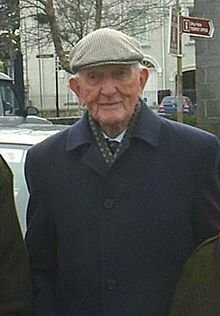 At the time of his death he was Ireland’s oldest man and the last surviving veteran of the Irish War of Independence. Dan Keating joined na Fianna Éireann in 1918. In 1920, during the Irish War of Independence, he joined the 3rd Battalion, 1st Kerry Brigade, of the Irish Republican Army. He was an active volunteer brve and daring. On the 21st of April 1921, an RIC Constable Denis O’Loughlin was shot dead in Knightly’s public house in Tralee. Keating, Jimmy O’Connor and Percy Hanafin were suspected of the killing, and were forced to go on the run. On the 1st of June, Keating was involved in an ambush between Castlemaine and Milltown which saw five members of the crown forces disposed off. Dan’s unit was involved in a gun battle with the British Army near Castleisland which resulted in the deaths of four British soldiers and five IRA volunteers. In 2002, he refused the state’s standard €2,500 award to centenarians from President Mary McAleese, Keating became patron of Republican Sinn Féin until his own death. He was buried in Kiltallagh Cemetery, Castlemaine. ‘Tralee became very militant IRA-wise. When there was some British soldiers shot one November night they decided to have this curfew. You had some very bitter policemen in Tralee also.’ Keating had begun working in Gerry McSeeley’s bar and bakery in Castle Street in Tralee, as an apprentice barman. ‘The first year you got no money, but you were well fed, before rising to a pound a week in the third year.’ His involvement in republicanism came not from lengthy historical or political study but from being swept away in the fervour of the time. He said there was no relevant history taught in schools, and that he and others were simply reacting to events and following each other into the ranks of the IRA. ‘It was the thing to do at the time—there was a wave and you got caught up in that.’ He was too young to join the IRA and joined the youth wing, Fianna Éireann, instead, providing information, from the vantage point of the bar or from elsewhere. With many thanks to: McKelvey Steele Cummann Republican Sinn Féin for the original posting.